Yes, it's a full week of vegan entrees for me and the SO. We are undeterred in our search for palatable vegan fare in food truck/tent land and, of course, we couldn't go on without trying some of that food from Hella Vegan Eats. More a food trailer hook-up that I'd seen at SOMA StrEat Food Park before but hadn't ventured to as it seemed to have long lines and waits and you know, that whole vegan thing. But on this particular day the line was minimal and we had time to kill so it seemed like the perfect opportunity to discover why they are so popular with the masses. I have to say, when you peruse their menu, they do make things seem rather enticing--from the hellaburger to the potsticker burrito to the campfire cookie--they totally get an A for menu descriptions. Since it's a Sunday and sort of brunch-ish time, what better way to kick things off than with one of their more seemingly popular items the "chicken" and waffles. It's crispy fried "chicken" with lavender sage butter, smoked maple syrup and a corn meal waffle for $12. So what is vegan chicken anyway? Honestly I'm not totally sure, though a little internet research says it's mostly a soy product with flavorings to get that chicken taste. From the pic it looked good. There was the crisp fried factor there and I'm gonna say there were (very) subtle notes of chicken somewhere in there, but it definitely won't chicken. More like deep fried flavored bread. The big problem though here for me was that they nearly drowned this whole thing in syrup from the get go instead of giving it to you on the side. Not doing this was a BIG mistake. It took away any crispness there might have been to the crust and pretty much overwhelmed whatever chicken flavor there may have been here with the maple flavor. This has been the only place I've had chicken & waffles where they pre-poured the syrup over things. For me that's a big no-no. Had I known beforehand I'd have asked it not be done. The faux chicken couldn't handle the deluge and turned to mush pretty quickly. It's too bad, I did like the subtle smokiness of the syrup, just not that much syrup. As for the waffle, I like a good cornmeal one and this was good. It held up savory wise from the syrup tsunami, though again, I would have liked to taste the sage butter and waffle more with a little less of the sticky sweet. 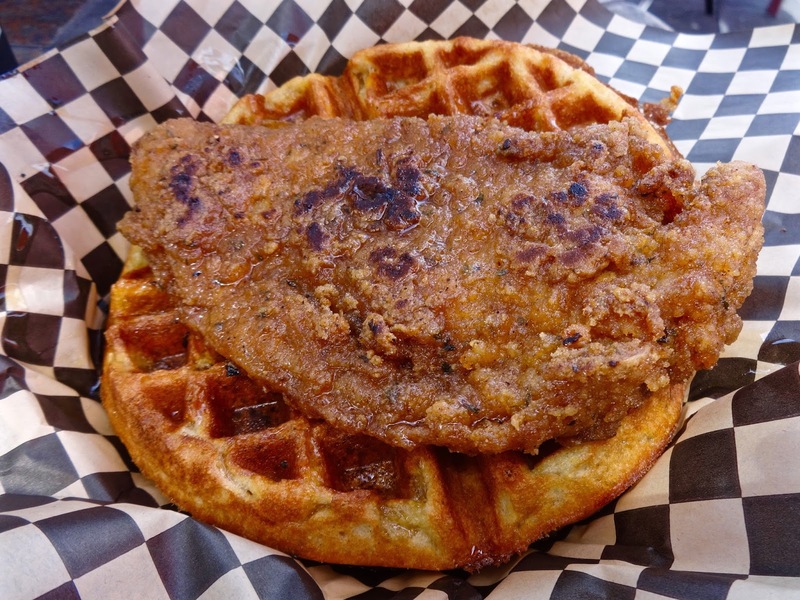 While I won't say I'm sold on this particular fried "chicken", I will give a thumbs up to the waffle. Large, crusty, good flavor, hint of sweet corn, hint of savory--I would totally have it again--syrup on the side and extra butter for sure. Not to be left with an aching maple sweet tooth we also got the "bacon" hash tacos $8. 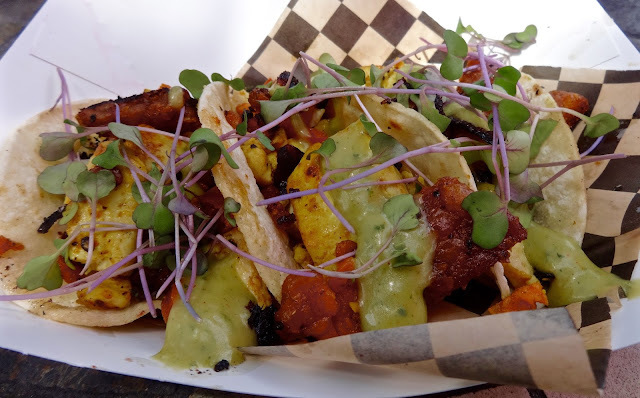 Smoked rhizocali tempeh bacon, roasted sweet potatoes, cauliflower, organic greens and egg like fried tofu in a vegan tortilla with avocado crema. This was a winner. All the fauxness came together here like a bacon, egg and potato taco. A little smoke, a little sweetness, some tang from the crema, it was really good and both me and the SO like it. It tasted like what it wasn't exactly supposed to actually be. For the price it would have been nice to get 4 tacos instead of 3, makes it easier to share and there's that whole cost what you get issue for me. Still, I can highly recommend these as a light bite brunch alternative. 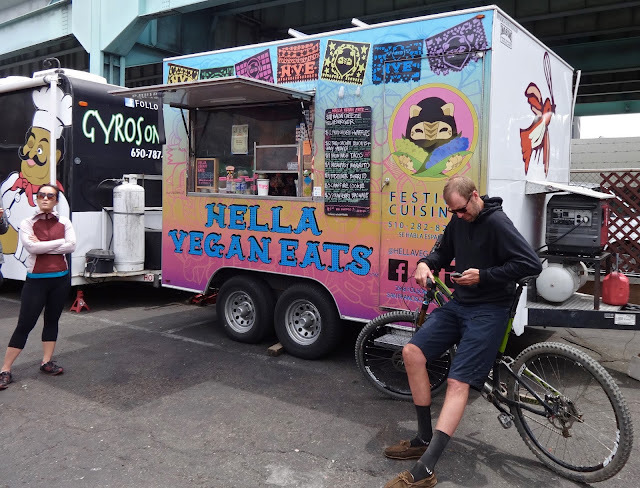 I guess in the grand scheme of things, Hella Vegan Eats, while not totally hella, still had some tasty alternatives that I could get on board with. Plus, they had enough interesting flavor profiles to make me intrigued enough to go back and try some of their other dishes. And, while I'm not jumping completely on the vegan wagon (hello real bacon and butter! ), I can see myself taking the occasional trip to that side of plant town.